You may walk a Labyrinth or trace through one with your hand. There is all sorts of wonderful information about the benefits this may bring. Most often one is encouraged to walk in towards the center with the attitude of releasing the days problems or issues at hand. 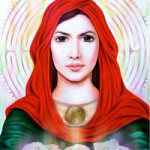 While in the center, there is the quiet space of receiving Divine inspirations and guidance. 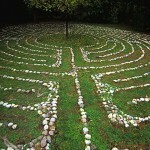 Walking out The Labyrinth is a time of returning and sharing with the Earth your Divine aspect. Co-creating with the energies received.